If you are in the market for some, the first step is to do some research. Compare different brands to see what they offer you. It’s a good idea to find reputable brands like Bridgestone run flat tires to see what benefits they have, as well as any specials stores may be running. Along with this, you’ll find Dunlop run flat tires, which have grown in popularity. Here is a breakdown of them. Dunlop run flat tires come in a wide variety of sizes to accommodate different types of vehicles. For example, their SP Sport Maxx DSST RunonFlat will add a sleek, sporty appearance to your ride while providing smooth handling. Typically, these are perfect for sportier cars and sedans, as the design enhances the performance of these types of vehicles. Now, let’s look at the drawbacks. For starters, Dunlop run flat tires like these are extremely expensive. On Tire Rack’s website a set of four will run you $1800, which makes these an unaffordable option for many people. Even if cost isn’t an issue, then there’s the problem with durability. After reviewing many customers’ reviews, there was one glaring problem and that was the tread wore away too quickly. While driving conditions and weather play a role, the fact that many saw their tread wear away within 10,000 miles is disturbing. Therefore, buying these can be a very expensive option, especially when you consider flat tire repair cost. Ultimately, Dunlop run flat tires have some benefits, but their durability issue outweighs the good. 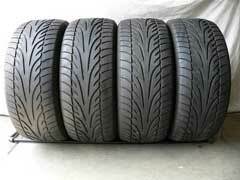 It is better to shop for other tires like Michelin, which have shown to hold up better. One of the best suggestions is to look for wheel and tire packages on websites like Tire Rack, as they provide discounts. This means you can receive a great quality wheel and rim for an affordable price.